Okay, you’ve likely heard about having your cake and eating it too, but what about ice cream? 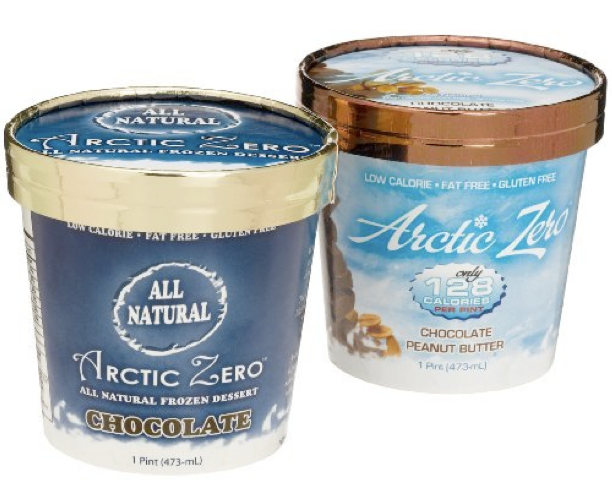 Arctic Zero is an ice cream-like treat that you can eat without guilt that is bound to cool you down quickly while satisfying your craving for ice cream! I discovered these pint-sized ice cream treats at Whole Foods, and I was a bit hesitant to believe that someone could eat an entire pint of delicious ice cream for 150 calories. Sounds too good to be true, right? Especially a product without artificial gunk in it? Thinking that it would be a terrible experience, I picked up a pint of the vanilla maple Arctic Zero to give it a try anyway just to see what could possibly be in there. :) It definitely wasn't perfect rich creamy ice cream, but it really exceeded my expectations. And, when I'm in the mood for ice cream and don't have a lot of calories to spare, it is something I'm happy to reach for. Arctic Zero is an all natural treat that is also fat free and free from gluten. This kosher treat is also perfect for those who are lactose intolerant as it is made with a high quality whey protein concentrate. And while I started my adventure with Arctic Zero with the delicious vanilla maple, I have since experimented with (and found each just as good as the other) chocolate peanut butter, and strawberry banana. According to their website, Arctic Zero also comes in mint chocolate cookie and cookies and cream which I've never had the opportunity to try. So what’s it sweetened with? According to their website, research and development guys at the company were looking for more natural source of sugar when they combined organic cane sugar with monk fruit concentrate and then added eight grams of fiber to every pint. The monk fruit is known as the sweetest melon in the world, with a sweetness that is 150 times that of sugar – so just one gram of monk fruit concentrate replaces, get this, 40 teaspoons of sugar. And its free from both saturated and trans-fats…what could be better? Here is the full ingredient list by the way: "Purified water, whey protein concentrate, organic cane sugar, chicory root, guar gum, xantham gum, natural flavors, sea salt, monk fruit concentrate." Currently, you can find Arctic Zero in thirty-seven states and that number is growing, or you can order it online at Amazon. I buy it at Whole Foods which gives me confidence that nothing shady is going on. :) I'm still a bit skeptical, though. If you are a serious ice cream addict looking for the lowest calorie ice cream out there, then this is definitely worth a try. Each pint is 150 calories (yes I did say *pint*), so 2 weight watchers point. Or, 1 weight watchers point per quarter pint serving. If you are looking for something super yummy, and have a few _more_ calories to spare, I recommend you eat Julie's low calorie ice cream sandwiches or so delicious low fat mini ice cream sandwiches, so delicious vanilla ice cream bar, or low calorie frozen yogurt. I've heard of this stuff and I have been looking for it..but no luck yet! Sounds amazing though! I get this at my local Whole Foods. I love it! I wouldn't even call it ice cream because it's guilt-free and I can eat the whole thing!! I LOVE THIS! I went out to Whole Foods today JUST to buy this "ice cream". I tried the chocolate and it's only 128 cals! So awesome. Thanks for posting about this and glad you are back to updating your blog! Thank you for introducing me to Arctic Zero. It definitely satisfied my desire to "go to town" on a whole pint of something cold and sweet. I tried the chocolate. The flavor is fine. Of course, don't expect this product to be luscious like real ice cream. The texture is more like a fudgesicle. Still, eating Arctic Zero is a lot of fun.